This page is about the city in Broward County. For other uses of Plantation, Florida, see Plantation, Florida (disambiguation). Motto: "The Grass is Greener" and "E Vasitate Haec Urbs"
Plantation is a city in Broward County, Florida, United States. As of the 2010 United States Census the population was 87,496. It is a principal city of the Miami metropolitan area, which was home to an estimated 6,012,331 people at the 2015 census. The city's name comes from the prior owner of the land, the Everglades Plantation Company. Plantation suffered extensive damage from Hurricane Wilma on October 24, 2005. The city has been used as a filming location for many popular movies. The high school in There's Something About Mary is actually Plantation City Hall, located at 400 NW 73rd Avenue and NW 5th Street. Rolling Hills Golf Course, recently renamed Grande Oaks, was the site of the famous Caddyshack pool scene. Plantation is located at (26.124354, −80.249503). According to the United States Census Bureau, the city has a total area of 22.80 square miles (59 km2), of which 21.74 square miles (56 km2) is land and 0.19 square miles (0 km2) (0.87%) is water. As of 2010, there were 37,587 households, with 9.0% being vacant. As of 2000, 30.9% had children under the age of 18 living with them, 52.0% were married couples living together, 11.2% had a female householder with no husband present, and 33.2% were non-families. 25.8% of all households were made up of individuals and 8.5% had someone living alone who was 65 years of age or older. The average household size was 2.48 and the average family size was 3.02. As of 2000, in the city the population was spread out with 23.1% under the age of 18, 7.1% from 18 to 24, 32.0% from 25 to 44, 24.7% from 45 to 64, and 13.1% who were 65 years of age or older. The median age was 38 years. For every 100 females there were 90.6 males. For every 100 females age 18 and over, there were 86.2 males. According to a 2007 estimate, the median income for a household in the city was $66,135, and the median income for a family was $80,434. Males had a median income of $44,838 versus $32,360 for females. The per capita income for the city was $28,250. About 4.3% of families and 6.4% of the population were below the poverty line, including 6.1% of those under age 18 and 6.7% of those age 65 or over. As of 2000, English as a first language was spoken by 78.00% of the population, while Spanish was at 13.00%, French Creole at 2.24%, French speakers made up 1.30%, Hebrew comprised 0.72%, Portuguese speakers comprised 0.71%, Italian was at 0.58%, German at 0.54%, and Arabic was the mother tongue of 0.46% of all residents. 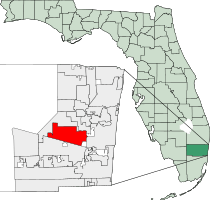 1838 – Battle of Pine Island Ridge – part of the seven-year Seminole War. 1906 – Captain Walter Holloway unsuccessfully attempts to drain the Everglades for farming; major canal runs north-south through Plantation. 1911 – Sewell Locks, first wooden locks in the state, are built on the New River Canal next to State Road 84. 1941 – Frederick C. Peters purchases 10,000 acres (40 km2) for $25 per acre; land had been owned by the Everglades Plantation Company (origin of the city's name); Broward Boulevard is a two-lane road. 1947 – First homes built by Chauncey Clark; property valued at $200 an acre; two hurricanes completely flood the area. 1948 – 12 homes in the area; population reaches 36. 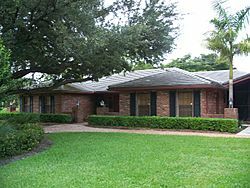 1949 – Plantation Women's Club founded; Plantation Homeowners organization founded by Dr. Abram Hoffman; 40 homes in the area. 1950 – Population reaches 200; Plantation Golf Club built. 1953 – Ellsworth D. Gage appointed first Mayor on April 30; Plantation incorporated as a city; first City Council meeting on May 11; Broward Boulevard grows to a four-lane street; population reaches 475. 1955 – S. Robinson Estey elected Mayor. He had previously been Deputy Sheriff; Plantation Police Dept. organized. 1957 – First industrial plant in Plantation – Airpax Products, Co. on Sunrise Blvd; City of Plantation Volunteer Fire Dept. 1958 – Population reaches 1,600. 1959 – James Ward Jr. elected Mayor. First school, Berenice T. Peters Elementary School, dedicated. 1961 – The Plantation Library is founded with Mrs. Helen B. Hoffman as chairwoman. 1962 – Edwin Deicke donates $100,000 for the expansion and renovation of Hoffman Building, later renamed the Deicke Auditorium; Chamber of Commerce founded. 1963 – Community Center, designed by Russell Pancoast, built and dedicated on city's tenth anniversary. 1965 – Population reaches 6,500. 1969 – Motorola opens facility in Plantation. 1970 – Gulfstream Land and Development Company purchases 5,400 acres (22 km2) for Jacaranda community development; population reaches 23,000. 1973 – Plantation City Hall opens and Deicke Auditorium dedicated. 1974 – Plantation Historical Society founded by Genevieve Veltri, Dorothy O'Hare, Lois Brickhouse, and Marilyn King. 1975 – Frank Veltri elected Mayor for first time; American Express moves Southern Region Operations Center to Plantation. Population 40,200, budget $4,229,569. 1978 – Broward Mall opens (1 million square ft). 1980 – The Plantation Historical Museum is founded; population 48,653. 1981 – Plantation Library is renamed the Helen B. Hoffman Plantation Library. 1982 – The population reaches 50,000; city budget reaches $12 million. 1985 – Plantation Historical Museum built. 1988 – Fountains Shopping Mall opens (450,000 sq ft); Fashion Mall at Plantation opens (660,000 sq ft). 1990 – The population reaches 65,000; city budget reaches $64 million; Central Park Elementary School opens. 1991 – Hartford's Cornerstone, Phase 1 opens. 1993 – Kemper National Services opens operations in Plantation. 1994 – Population reaches more than 73,500. 1996 – Olympic Torch Run weaves through Plantation. 1997 – Population reaches 78,000; city budget is in excess of $80 million. 1999 – Rae Carole Armstrong elected as Mayor of Plantation; 11,500-square-foot (1,070 m2) Volunteer Park Community Center dedicated. 2000 – Population 84,500 and 55 diverse cultures; Presidential election delayed; Plantation Elementary moves to new school site; ground broken for Jim Ward Community Center. 2001 – Ground broken for Happy Tails Dog Park; Multicultural Garden opens in Park East. Community Bus Service in operation. 2002 – Jim Ward 16,000 sq ft (1,500 m2) Community Center opens; Jack Carter Harmony Park dedicated; Happy Tails Dog Park dedicated. 2005 – Hurricane Wilma hits Plantation on Monday, October 24, 2005 causing significant damage. 2008 – Plantation named one of the nation's 100 Best Communities for Young People by America's Promise Alliance. 2015 – Judge John K. Olson of the U.S. Bankruptcy Court of the Southern District of Florida rules on the auction sale of the Plantation Fashion Mall. 2016 - Demolition of Fashion Mall begins. Plantation, Florida Facts for Kids. Kiddle Encyclopedia.